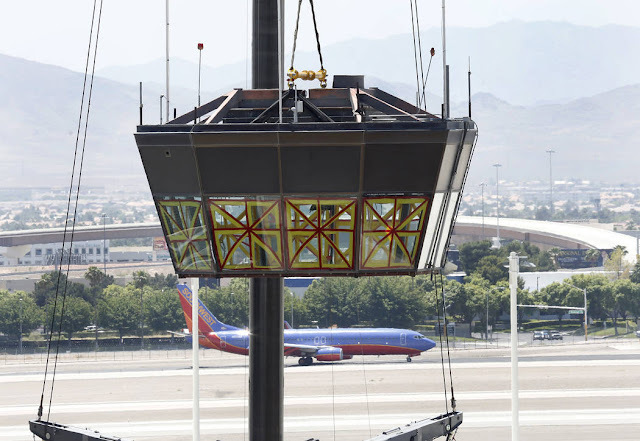 The third attempt was the charm Friday afternoon, when demolition crews finally plucked a 525-square-foot cab from atop the decommissioned air traffic control tower at McCarran International Airport. Strong winds hampered two previous tries this week to remove the glass-paneled compartment that once served as a look-out point for the controllers charged with guiding jetliners in and out of Las Vegas. The 185-foot-tall tower, built in 1983, was taken out of service last August to make way for a new $99 million tower standing 352 feet tall. The obsolete structure sits within an active airfield, creating an extra dose of caution during a nearly $2 million tear-down project expected to last through summer. Bringing down the controller’s cab was no easy feat. Work was scheduled to start Wednesday afternoon, but gusty winds kept crews from moving forward, the Federal Aviation Administration said. Demolition workers reconvened at 6 a.m. Thursday to separate the cab from the top of the tower. Blow torches tore through bolts and metal, while a giant tether was wrapped around the cab like a giant, black ribbon. The crane’s boom was briefly extended, then retracted when winds kicked up and brought work to a halt until the next day. The crane swung back into action at 6 a.m. Friday as crews spent another six hours preparing for the cab’s removal. Then, there was movement at the stroke of noon. Finally separated, the cab was hoisted a few feet above the tower and was moved a few feet north. 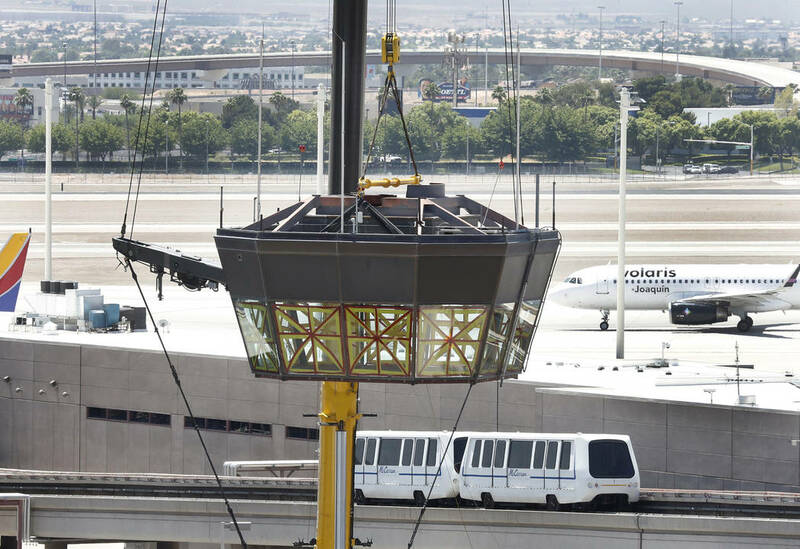 Despite the work, it was business as usual at McCarran. Planes continued to soar into the sky, and most vehicles whizzed through the airport’s winding roads, except for a few taxicab drivers who pulled over to watch the cab lowered onto a parking lot previously used by FAA employees. The nine-minute descent was faintly reminiscent of the midnight crystal-ball drop in New York’s Times Square to ring in the new year at midnight — except this was high noon at the nation’s eighth-busiest airport. Crews from Advanced Integrated Solutions started gutting the tower’s interior in March, starting with hazardous materials abatement, FAA officials said. By mid-April, power conduits and conductors were removed, while walls, ceilings and light fixtures got torn out. The ground radar system, also removed in April, will be refurbished for a new air traffic control tower under construction at Charlotte Douglas International Airport in North Carolina. After the demolition dust clears, the tower’s 13,740-square-foot base building will be converted into office space for Clark County’s Department of Aviation, airport officials said. NEWPORT NEWS, Va. (WVEC) -- The Virginia Department of Transportation found that the Peninsula Airport Commission (PAC) inappropriately used state funds to pay debt left by the failed People Express. VDOT's Assurance and Compliance Office (ACO) conducted an audit of the PAC at the order of Secretary of Transportation Aubrey Layne. Commonwealth Entitlement Funds were used for unauthorized purposes. Commonwealth Entitlement Funds were used as collateral to guarantee a TowneBank "Draw Down Line of Credit" issued to People Express (PEX), a private corporation. Commonwealth Entitlement Funds were used to satisfy the default obligation of PEX at TowneBank. PAC administrative staff, including the former executive director did not always provide complete, open, and timely disclosure of key and/or material matters to the commission. Conflicts of interest, either real or perceived, were not disclosed. The ACO recommended that the airport commission reimburse the Commonwealth $4,511,153 and take all reasonable steps to recover state, local, and airport funds used to satisfy the default obligation of PEX. Interim Executive Director for the Peninsula Airport Commission Sandy Wanner said it’s too early to figure out how the commission would recover the funds. Wanner told 13News Now the PAC acted upon some of those quickly, including recommendations at the management level. State officials cut off funding to the airport in in January and Layne directed the audit to begin. Layne spoke to 13News Now over the phone Friday afternoon and said he believes the audit speaks for itself. Layne plans on working with the airport commission as it moves ahead. “Recommendation will be what we need from them so they can get state funds again,” Layne told 13News Now. “There's nothing to hide, and we will be open and transparent,” Wanner promised. 13News Now looked into what some of the “reasonable steps” available to recover the funds are. The airport sits on roughly 825 acres. City records show that land, itself, is worth $24,738,800. Everything on the land is worth $35,765,100, which brings the total value to $60,503,900. Land values are reassessed every year, so on July 1, 2017, that number will increase to $63,459,600. The total value is more than the $4,511,153 debt. It's not clear if the PAC could use that worth to repay the money or if it even is an option to sell off some of the land or what's on it to recoup what the commission owes. There's no word yet on how the Peninsula Airport Commission will repay the state, or, if it's even an available option to sell off some of the land or what's on it, to recoup what the commission owes. As for preventing similar practices in the future, the state recommended the commission establish clear policies and procedures for drawing up contracts such as the one related to People Express. There is a special meeting of the Peninsula Airport Commission on Monday, June 5 at 4 p.m. in the Newport News/Williamsburg International Airport Banquet Room. Discussion will include legal issues relating to the VDOT audit, the People Express Airlines, Inc. loan, and extending the interim executive director's contract. NEW DELHI: India's serious aircraft accident investigator has asked Air India to ensure that its crew (read pilots) board aircraft at least 20 minutes before departure time and that a minimum time gap of 30 minutes be kept between two flights — an incoming and departing one — if crew from the former have to be used to operate the departing flight. The Aircraft Accident Investigation Board (AAIB) has also asked AI to ensure that in the absence of pilots in cockpit, another pilot of the same airline who is travelling as a passenger on that flight should not be allowed to get flight (pre-take off) clearances. These recommendations have been made in the AAIB probe report of an accident in which an AI ground service engineer was sucked into the engine of an Airbus A-319 that was to operate from Mumbai to Hyderabad as AI 619 on December 16, 2015, at Mumbai Airport. The engineer had died on the spot. The three-member AAIB probe panel of its senior officials Raje Bhatnagar, K Ramachandran and Amit Gupta, has also asked the Directorate General of Civil Aviation (DGCA) to immediately ask airlines to have proper time gap for crew rostering. These recommendations have been in the recently-released report that found the exact cause for the unfortunate loss of life of the AI ground engineer. 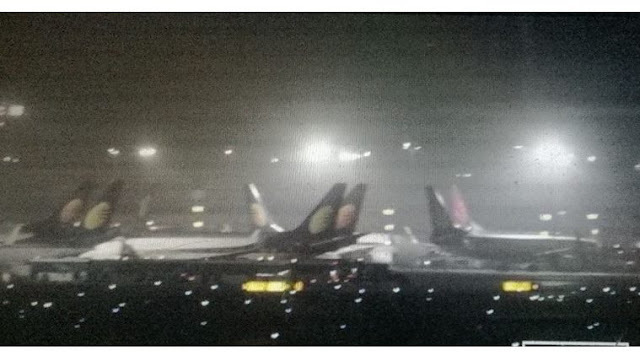 "On December 16, 2015, AI Airbus A-319 aircraft VT-SCQ was scheduled to operate flight AI-619 (Mumbai - Hyderabad). Both the cockpit crew were earlier scheduled to operate Mumbai- Rajkot-Mumbai on A-320 aircraft and Mumbai- Hyderabad -Mumbai on A-319 aircraft," it says. The expected time of arrival of the Rajkot-Mumbai (AI-656) was (Rajkot - Mumbai) was 8.10 pm but the aircraft landed and reached its parking bay that day at 8.35 pm. The Mumbai-Hyderabad flight had a schedule departure time of 7.30 pm, which was delayed as the pilots supposed to operate this flight had not landed in Mumbai in time. "Thereafter both cockpit crew got down from the (Rajkot-Mumbai) aircraft and rushed to... operate AI-619.... another pilot of Air India who was staff off duty (SOD, seated in passenger cabin) and was on board the flight AI-619, as passenger took clearance from ATC.... before the PIC entered in the cockpit.... Pushback was started at around 8.45 pm," the report says. The engines were started after taking clearance from ground service engineer during pushback. At this time, four persons were on ground for departure of the aircraft — the deceased service engineer, an engineering helper, another helper and tow truck operator. Then the process of preparing the aircraft to taxi out on its own power began. 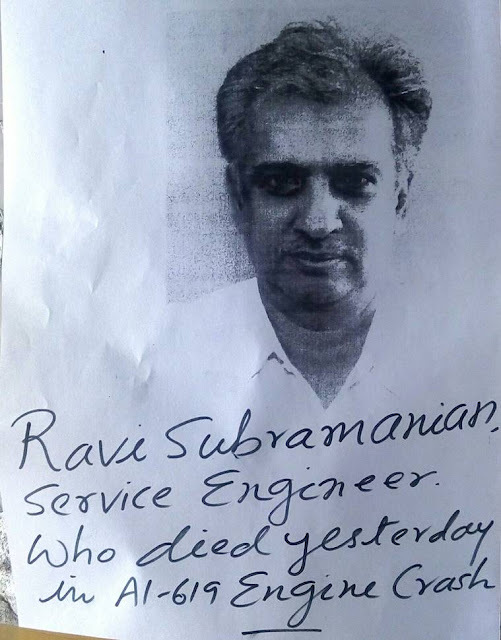 "As per the statement of the helper and tow truck operator, the deceased ground service engineer removed the nose wheel steering pin and was standing at the same position.... Meanwhile, the aircraft started moving with engine power. The deceased engineer was standing at the same point, facing back towards the aircraft with headsets on his head, not realising that the aircraft has started moving. The aircraft number 2 engine came very close to the deceased engineer and sucked him," it says. All the other ground personnel ran away from the aircraft and the tow truck driver towed the tow truck away from the aircraft leaving tow bar. The nose wheel of the aircraft hit the tow bar and the tow bar got stuck with the right side main landing gear wheel. The pilot heard 'thud' sound twice and immediately stopped the aircraft. "He also stated that someone from right side came running towards the aircraft and signalled to shut off the engine. The pilot shut off number 2 engine first and then number 1 engine. Later after nine minutes ground personnel connected the intercom headset and appraised the pilot about the situation," the report says. The accident happened at around 8.48 pm and the engineer received fatal injury. The AAIB concluded that this accident and resultant loss of life happened due to "non-adherence to standard operating procedures and delayed departure of flight due (to) improper rostering of crew." 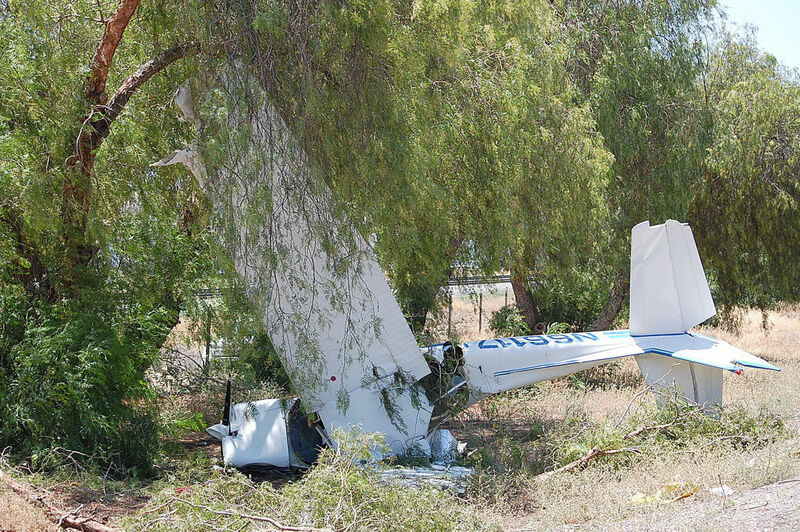 The airplane sustained substantial damage to its canopy and empennage. The pilot reported that the weather at the accident site about the time of the accident was wind from 330° at 12 knots, gusting to about 20 knots. The pilot landed on runway 06. An automated weather observation system about 14 nautical miles from the accident site reported that, about the time of the accident, the wind was from 310° at 8 knots, gusting to 16 knots. 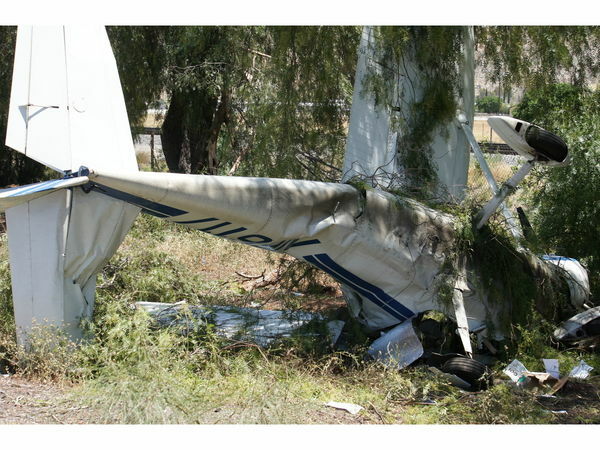 The pilot’s failure to maintain directional control while landing in gusting wind conditions. TUCKER COUNTY, W. Va. (WDTV) -- According to Tucker County 911 officials, a small, home-built airplane crashed during take-off at Windwood Fly-In Resort, Friday afternoon. Dispatchers say it happened around 2:30 p.m.
Two people were in the aircraft, but it's not believed there were serious injuries. EMS was called to the scene but no one has been taken to the hospital. The plane did not hit any other aircraft or buildings. Canaan Valley Fire and EMS are on scene, as well as Tucker County EMS. 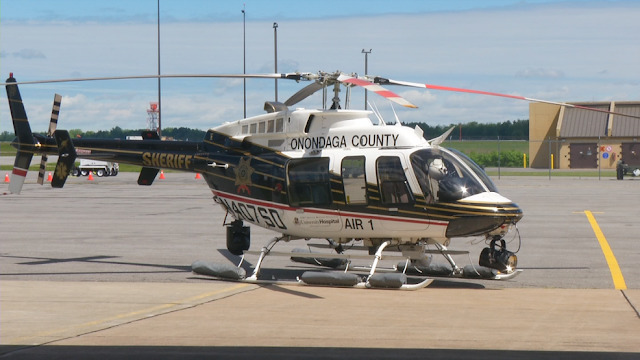 The Onondaga County Sheriff's Office Air1 helicopter has a new home. Sheriff Gene Conway announced on Friday that the department will be moving their search and rescue helicopter, Air1, to a hangar on the National Air Guard Base. The heliport will be named after Carl Mosegard, the first pilot for the Sheriff's Aviation unit that began in 1973. "This all began some time ago as a result of having a building in a very poor condition and a very expensive piece of equipment inside it. As you can imagine, there are not a lot of places where a helicopter will fit," said Sheriff Conway. The location will provide Air1 with enough space to shelter the ship, perform maintenance and effectively carry out training. Air1 provides multipurpose law enforcement and emergency response services to Onondaga County. LAKELAND — Their agency faces a billion-dollar cut under President Trump's proposed spending plan but the people who keep the fleet of hurricane hunters in the air say their new center in Lakeland is opening with a planned budget hike. "We are solid," said Capt. Michael Silah, chief of the center, at a ceremony Friday marking the opening of the 58,000 square foot Aircraft Operation Center, part of the National Oceanic and Atmospheric Administration. In November, NOAA agreed to lease the center for $15 million to $16 million over 10 years, Silah said. MacDill Air Force Base hosted the center for the past two decades but had to send it packing to make room for more KC-135 refueling jets. 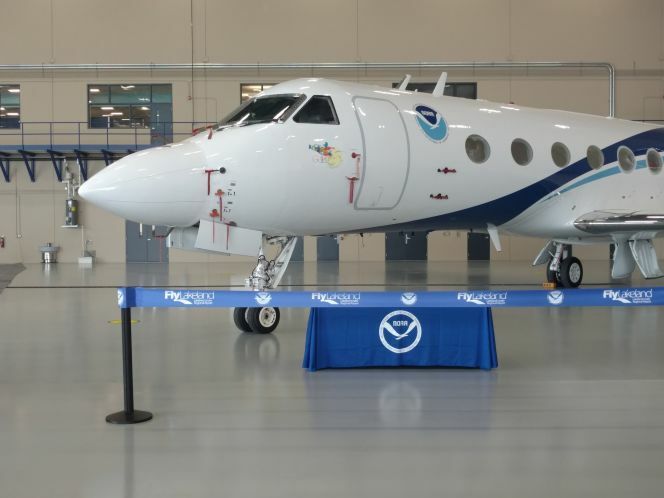 The Trump budget calls for an increase of nearly $2 million increase, to $34 million, in the Aviation Operations and Aircraft Services sub-program, according to NOAA budget figures. The boost is for increased lease and fuel costs for the new center at Lakeland Linder Regional Airport. Overall, the agency budget is taking a hit to help fund Trump's national security priorities. The proposed budget of $4.8 billion is about $1 billion less than this year's. A key NOAA research effort, the Office of Oceanic and Atmospheric Research, faces a proposed spending cut from $489 million to $350 million. An $11 million tornado study in the South also would be eliminated. 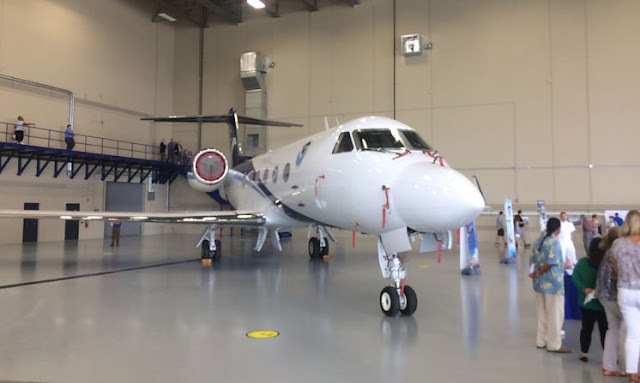 Still, Benjamin Friedman, the man temporarily running NOAA, said in an interview at the Lakeland ceremony that the agency will continue protecting the public through weather forecasting — a mission served by the nine hurricane hunting aircraft now stationed in Lakeland. "We are focusing on our primary core mission of public safety," said Friedman, acting undersecretary of commerce for oceans and atmosphere. U.S. Rep. Dennis Ross, the Lakeland Republican, attended the ceremony but would not comment on whether he supports the NOAA cuts. Ross did say he supports the hurricane-hunting operation because it saves $3 for every dollar of public money spent. Officials speaking at the ceremony lauded the effort that brought the aircraft operations center from MacDill to Lakeland in about 250 days and under budget. Headed east are Kermit and Miss Piggy, both venerable Orion WP-3 propeller planes, along with a Gulfstream IV jet known as Gonzo, six other aircraft and about 110 employees. The Orions fly into storms, collecting information about track and intensity, while the Gulfstream IV flies above, collecting data. The new center is better suited for NOAA than MacDill "because we helped design it," Capt. Silah said. So far, the Gulfstream and two DeHavilland Twin Otter propeller aircraft have made the move to Lakeland. Kermit will arrive in another two weeks and Miss Piggy later this summer after renovation work that includes new wings, engines, avionics and radar. Lakeland Linder was selected as the lowest of two bidders, with a 10-year, $13.5 million proposal that included building out an existing hangar shell. Only one other location competed, Silah said — St. Pete Clearwater International Airport. In an interview Friday, Silah said the lease price increased because of additional requirements. Still, he said, the move came in 55 percent under original government estimates. MacDill was never in the running because it had no money to build a new hangar and couldn't meet construction deadlines, Silah said. For NOAA, the move was made necessary when the Air Force allocated eight additional KC-135 Stratotanker aerial refueling jets to MacDill's contingent of 16. That meant the base needed Hangar 5, NOAA's long-time home, to accommodate the new jets and some 400 crew members. The Friday Harbor Airport on San Juan Island, Wash., received official clearance this week for flight. Pending FAA approval, a Canadian airline hopes to start booking passengers within the next month. One-way flights will start at $49. 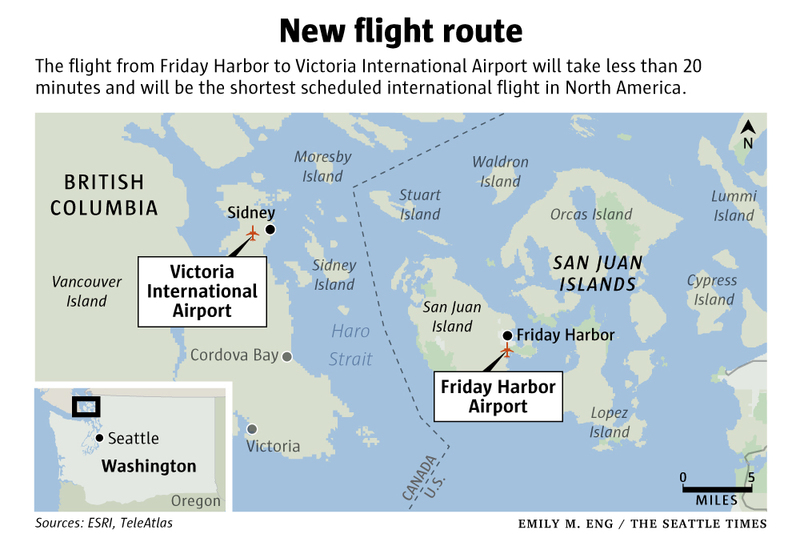 North America’s shortest scheduled international flight — less than 20 minutes — will soon take off daily from Friday Harbor Airport and land in Victoria, Canada. Friday Harbor, on San Juan Island, and Victoria, on Vancouver Island, are only 20 miles from each other but separated by a strait and an international border. Travelers’ options have been limited to driving, taking a seasonal ferry or chartering a plane. It was the long travel time and cost that made Rick Hughes start asking questions about an easier route. Years ago, the San Juan County Council member wanted a nice Valentines’ Day getaway to Victoria for himself and his wife. But the ferry from Friday Harbor to Sidney, B.C., which takes an hour and 15 minutes, doesn’t run during the winter. Driving would take a full day. Charter flights cost between $300 and $700. “I didn’t understand why it was so close, but we couldn’t get there,” Hughes said. Agencies on both sides of the border had been wondering the same thing. So they worked together to establish a way for U.S. Customs and Border Patrol (CBP) agents to clear passengers at the airport daily. It took three years, but Friday Harbor Airport received official clearance this week for the flight. Pending FAA approval, a Canadian airline hopes to start booking passengers within the next month. A one-way ticket will start at $49 on a nine-passenger plane, Northstar Air Tours owner Henry Emson said. Round-trip fare on a ferry is $24.05 for an adult. With a car, it costs $129.75. The main focus was figuring out a way to guarantee customs agents would be at the airport when passengers arrive. Pilots on chartered planes can request an agent, but there’s no guarantee that one will be available to clear passengers for entry. The Port of Friday Harbor agreed to provide CBP office space at the airport, and San Juan County and the Town of Friday Harbor paid $30,000 for security equipment and to remodel office space. Officers will be stationed for a few hours in the morning and afternoon, which will make it easier for pilots on private planes, too. For Hughes, the new flight means shorter business trips — and a new plan for Valentine’s Day. Kilton Kingsman, who has been named Angel Flight Southeast's Pilot of the Year, stands for a photo on Thursday, June 1, 2017, in Pensacola. Kingsman is a newly promoted lieutenant commander in the U.S. Naval Reserve and flight instructor at Pensacola Naval Air Station. When Robert Greathouse had to get to Tampa almost two years ago for a bone marrow transplant, he didn't know what to do. The 53-year-old Pensacola resident was diagnosed with leukemia in November 2014, and eight months later chose to go to Tampa for treatment. As he was facing a 500-mile, one-way trip at least once a month, Greathouse heard about Angel Flight Southeast, a nonprofit volunteer pilot organization that provides free air transportation in Florida for patients needing medical care. One of the pilots Greathouse met on his flights was Kilton Kingsman, a newly promoted lieutenant commander in the U.S. Naval Reserve and flight instructor at Pensacola Naval Air Station. Kingsman flew 26 missions last year for Angel Flight Southeast using a four-seat aircraft out of Ferguson Airport. 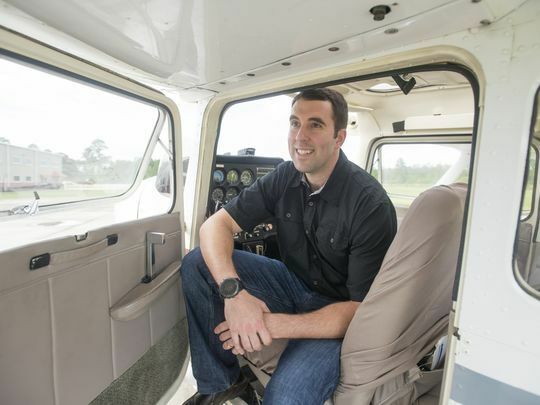 Earlier this spring, the 33-year-old was named Angel Flight Southeast's Pilot of the Year for 2016. "We try to make them as comfortable as we can in a small aircraft," said Kingsman, now settled in Pensacola after serving 10 years active duty in the U.S. Navy, which included two deployments to the Middle East. "We're trying to put them at ease with the whole process. It can be bumpy one day or we can fly through rain showers. You're trying to talk with them and treat it like a road trip." Kingsman is not only Angel Flight Southeast's top volunteer. He is also Greathouse's favorite pilot in the organization. Greathouse estimated he's flown with approximately 10 pilots since he started using Angel Flight Services in 2015. "We clicked," Greathouse said of Kingsman. "We get in the air and we chitchat and he takes my mind off all that I'm going through." Kingsman, who is from Chattanooga, Tennessee, is the father of two boys, ages 4 and almost 2. He said he never had the time to lend to Angel Flight Southeast before coming to Pensacola. Volunteering for the organization helps Kingsman maintain his proficiency time in the cockpit. "It's a great way to get flight hours," he said. Greathouse said he feels better now. He's still fighting fatigue and he anticipates needing to rely on Angel Flight Southeast for another seven to eight months as he continues treatment. "It is amazing what they do," he said. "It's a whole lot easier than an eight-hour trip (by car) one-way." Kingsman flies patients in a Cessna that belongs to a friend, Jim Hamilton, who donates the use of the plane to Angel Flight Southeast. Kingsman pays for the fuel for the plane and gets a discount through Angel Flight Southeast. "It's basic but it's good for regional stuff," said Kingsman of the plane. "It was a straight-up blessing having Jim as a friend." 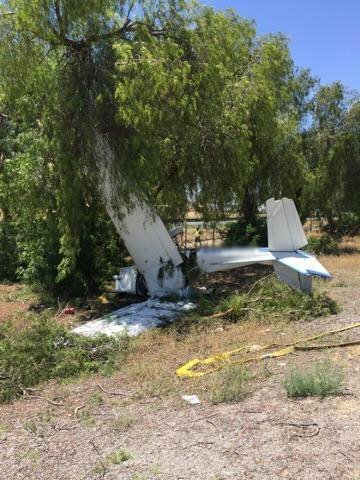 On June 2, 2017, about 1130 Pacific daylight time, a Cessna 150M, N66117, collided with trees and the ground shortly after departing from Banning Municipal Airport (BNG) Banning, California. 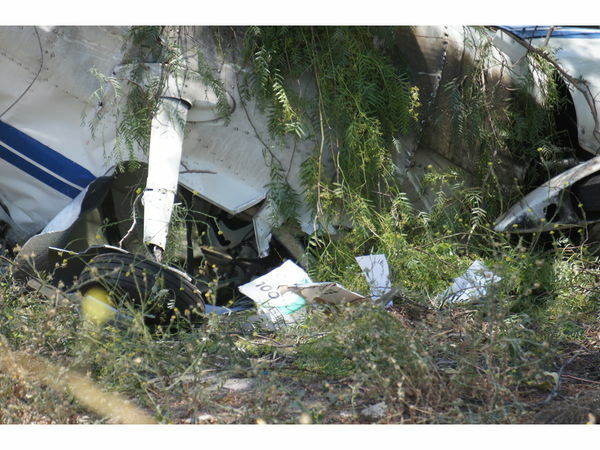 The certified flight instructor (CFI) was fatally injured and the student pilot sustained serious injuries. The airplane sustained substantial damage to both wings and fuselage. 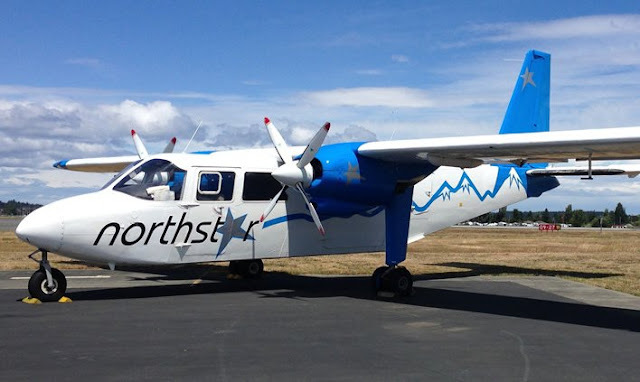 The airplane was registered and operated by Aerotech Academy Inc. under the provisions of 14 Code of Federal Regulations Part 91, as an instructional flight. Visual meteorological conditions prevailed and a flight plan was not filed. The flight originated from Redlands Municipal Airport (REI), Redlands, California about 1045. The student pilot reported that they were inbound to BNG where they planned to perform a touch-and-go landing. They entered the right traffic pattern for runway 26, and proceeded to land. The student pilot reported that the landing was hard and the wind was gusting, however, they continue the touch-and-go. He reported that after takeoff, the airplane drifted right of runway centerline and the CFI took control of the airplane. The student's last memories of the event was impacting trees along the freeway. A witness at BNG reported that he observed the accident airplane on approach to runway 26. He stated the pilot did a touch-and-go and shortly after the airplane became airborne, about 100 feet AGL, it began to descend and began to lose altitude. 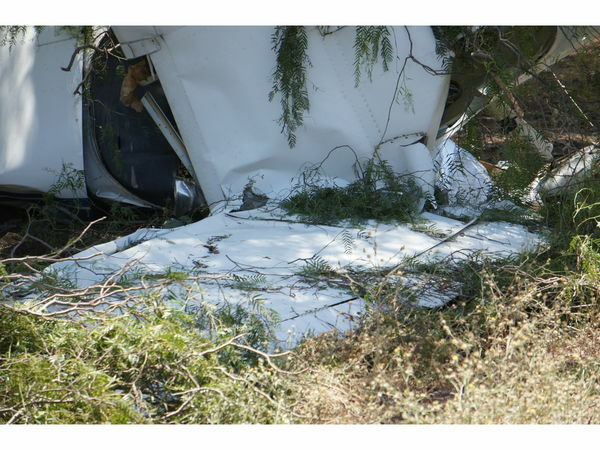 He stated that shortly thereafter, the wings wobbled and the airplane subsequently impacted trees and terrain near the railroad tracks on the northwest side of the airport. 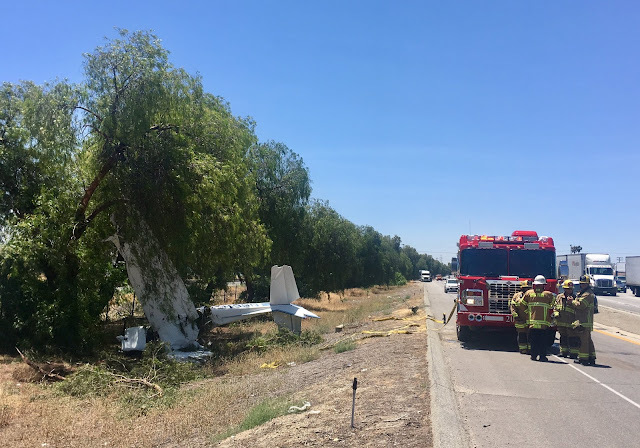 The initial examination of the airplane by a Federal Aviation Administration inspector revealed that the airplane came to rest between a row of trees and the eastbound freeway onramp. The airplane was on its left side and the left wing was partially attached. Impact damage was noted to one of the propeller blades; the opposing blade was unremarkable. The AWOS data at BNG at 1120 and 1140 recorded winds from the east at 17 knots gusting to 23 knots, and 17 knots gusting to 22 knots, respectively. Flight instructor Stanley Cleveck (left) with student Matthew Graves. The local flying community lost a cherished flight instructor when on Tuesday, June 6, Stanley Cleveck, 87, died of injuries sustained in a June 2 plane crash. The crash was reported on eastbound Hargrave Street in Banning at about 11:33 a.m. Cleveck and one other passenger were in the Cessna 150. Cleveck, a Navy veteran, passed at Desert Regional Medical Center on Tuesday, and the other passenger is reported to be in stable condition. 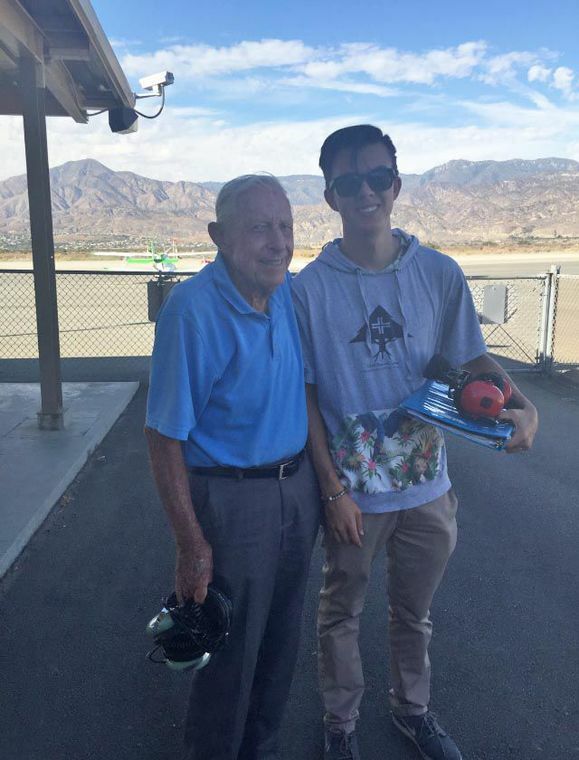 Highland resident Matthew Graves, 18, was taking lessons from the longtime flight instructor out of Redlands Municipal Airport. He says Cleveck will be greatly missed. "Everyone knew him, everyone was happy around him, and everyone liked him," Graves said. "I want to say, 'Thank you,' for everything he did to share his passion and help me and his other students." "Next year I'm going to Cal Baptist University for aviation, and the rest of my career I'll always keep him in mind because he taught me everything I know," Graves added. "We came from very different age groups but we still got along really well, There's something very cool about him. He passed away doing what he loved; his passion was flying." 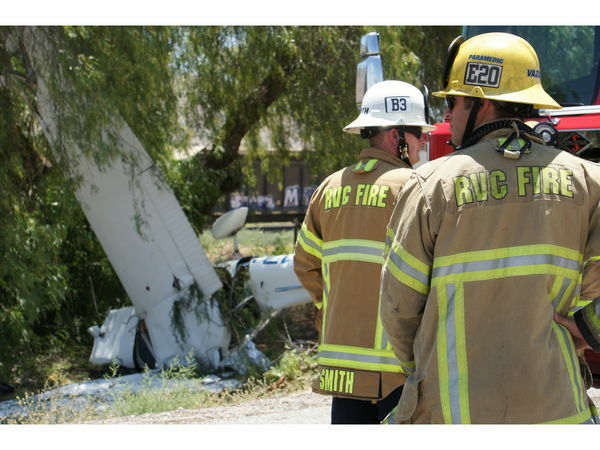 BANNING, CA — A man has died following Friday's plane crash next to Interstate 10 in Banning, Patch has confirmed. The man died Tuesday at Desert Regional Medical Center, according to the Riverside County coroner's office. Coroner's officials say 87-year-old Stanley Cleveck died at 10:38 p.m. Tuesday. Cleveck was a resident of Patton, which is in San Bernardino County near Highland. The crash was reported at 11:47 a.m. Friday alongside I-10, near the Hargrave freeway onramp. When fire officials got to the scene, they pulled two people from the wreckage and transported them to the hospital. It's not clear if Cleveck was the pilot or passenger in the aircraft. Allen Kenitzer with the FAA said the plane was a Cessna 150 and that the FAA and the NTSB will investigate. Officials tell Patch that the plane had taken off in Palm Springs and was headed to Banning Municipal Airport, which is close to the crash site. BANNING, Calif. - Cal Fire is responding to an aircraft emergency after a single-engine airplane went down near I-10 east of Hargrave Street in Banning Friday morning. The plane crashed at 11:34 a.m. 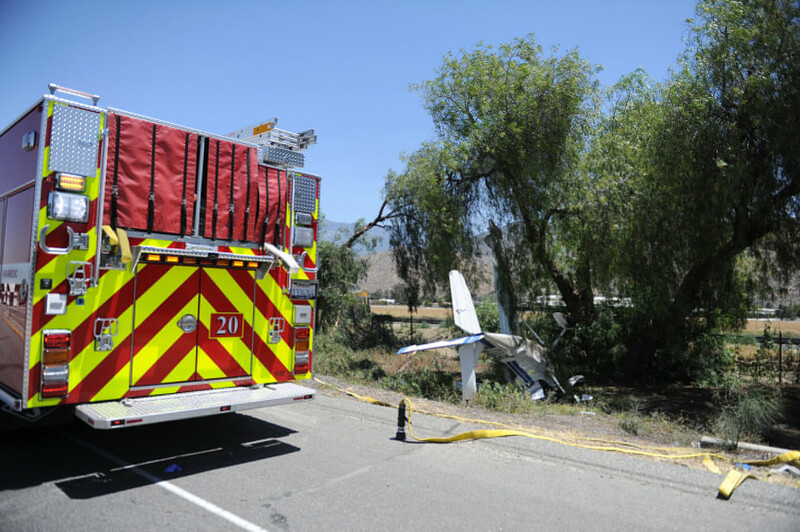 Authorities said the plane had just departed the Palm Springs International Airport en route to the Banning Airport. Officials said the plane was in landing configuration when the pilot lost control and crashed near I-10 and Hargrave Street. Lauren Coronado was at the scene of the crash Friday afternoon. The pilot said there was a strong wind draft that turned the plane upside down before it crashed to the ground east of I-10. The crash isn't affecting freeway traffic but the eastbound on ramp from I-10 to Hargrave Street is closed while emergency crews clear the scene. Cal Fire officials said the Banning Police Department is helping with the on ramp closure. 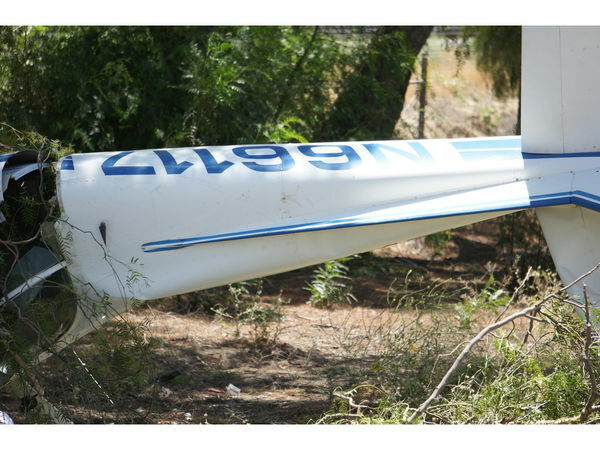 Banning, CA - A combination of gusty winds and the pilots' inability to maintain control may have precipitated a fatal plane crash in Banning, according to federal investigators. The National Transportation Safety Board last night released its preliminary report on the June 2 crash of a Cessna 150 at Banning Municipal Airport, pointing to weather and handling errors as possible factors. Stanley Clebeck, 87, of Patton died in the crash, while the student pilot flying with him suffered major injuries from which he's still recovering. 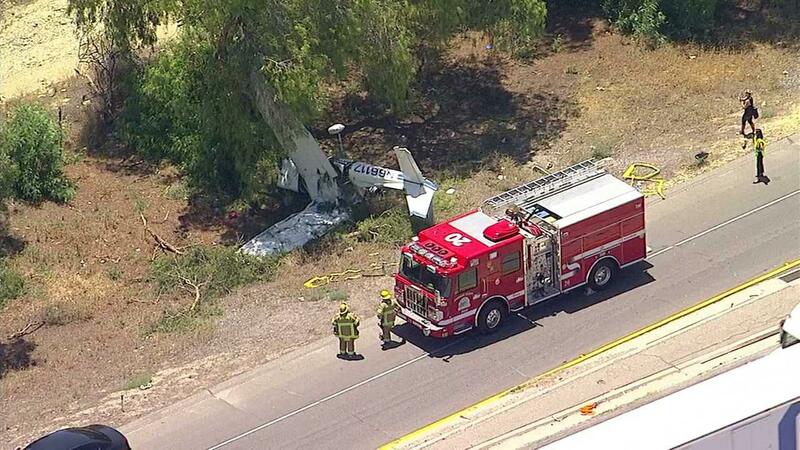 According to the NTSB, the two-seat C-150 trainer belonged to Aerotech Academy, a flight school based at Redlands Municipal Airport, where Clebeck was an instructor. 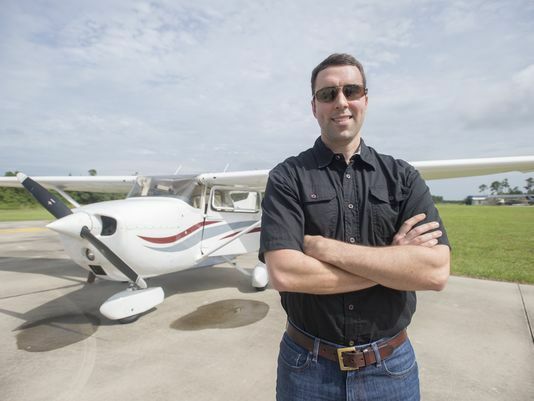 Federal Aviation Administration records show that in addition to holding a valid flight instructor's certificate, he also held an airline transport pilot's license and had passed a flight physical in January. 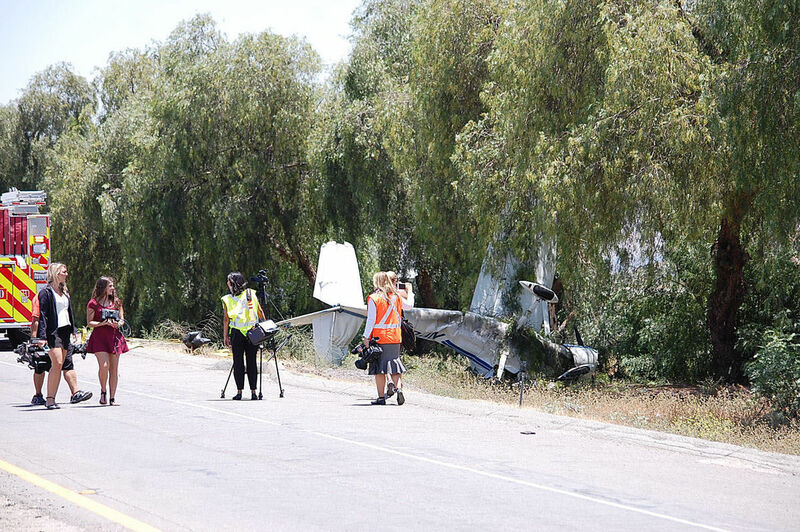 Clebeck and the student pilot -- whose identity was not released -- left Redlands about 10:45 a.m. and eventually steered toward Banning, where they intended to execute a touch-and-go landing on Runway 26, the report stated. About 11:30 a.m., with the student at the controls, the single-engine Cessna entered the pattern at Banning, lining up for the touch-and-go without incident. A witness told investigators that he observed the plane climb to about 100 feet after the touch-and-go, then it began to settle back toward the ground. ``He stated that ... the wings wobbled, and the airplane subsequently impacted trees and terrain near railroad tracks on the northwest side of the airport,'' according to the report. The Cessna came to rest on its left side, along Hargrave Street, adjacent to an eastbound on-ramp to Interstate 10. No one on the ground was hurt, and there was no post-impact fire, though both of the aircraft's wings and its fuselage were substantially damaged. 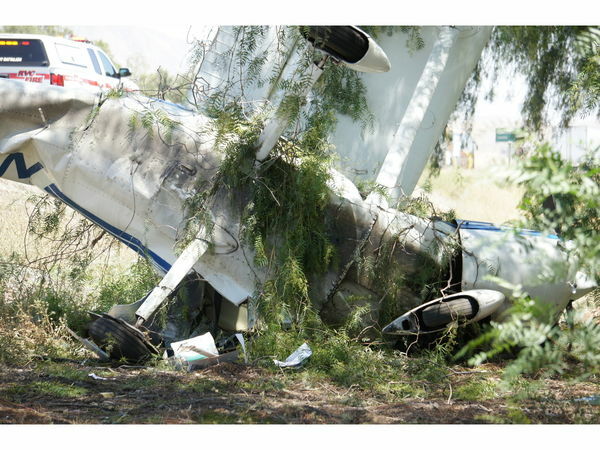 Clebeck and the student pilot were pulled from the wreckage by Riverside County firefighters. Clebeck was taken to Desert Regional Medical Center in Palm Springs, where he succumbed to his injuries four days later.